I LOVE these dining chairs at Sol Y Luna! Woof! 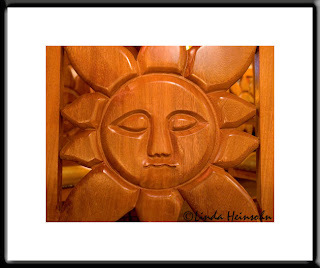 All their chairs have a large, carved wooden sun detail. What I like about this shot, which I couldn't see in the dim light of the restaurant, is you can see details of other suns through the spaces of my sun. Cool, huh? (You may have to double click the photo to make it large enough to see the other suns.) I shot this in existing light so the reflections you see are from the camera's eye trying to get a fix on the subject for auto-focus reasons.